Ok, I finally got my hands on the final consumer models and have given them enough play time to feel like I know what’s going on. 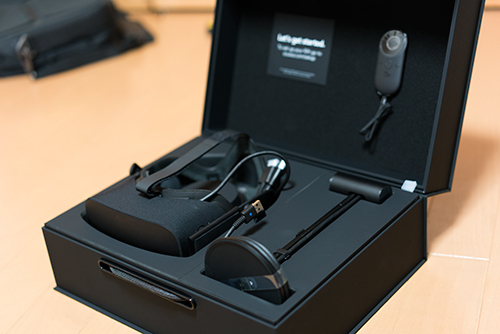 If you’ve been living under a rock and don’t know what these are: they are kits for your computer to enter the magical world of “Virtual reality” apps and games. Which parts are the same between these devices? Both have their own store/in-between game area that allow you to change and buy games without taking your headset off. Both screens don’t handle certain high contrast images great, like white text on a black background. It sort of adds a glare or foggy type of feel due to the lensing structure. Rift might have a slight advantage in the visuals. The Rift headset is slightly lighter and more comfortable than the Vive. It has built-in (but removable) headphones which simplifies getting in and out of it. It’s packaged with a tiny remote that reminds me of the Apple TV or FireTV remote. It’s reported to be usable for 4,000 hours before needing a battery replacement – not surprising considering it doesn’t have a gyro, haptics, or anything else, it’s just for simple selections. This is a decent update to my old Oculus DK2. We’ve now got 2160×1200 vs 1920×1080, faster refresh, built in mic/audio, and it’s lighter to boot. You can now swivel a true 360 degrees because the headset has had tracking LEDs placed on the back too. Unfortunately the tracking technology choice is what potentially dooms it, more on this later. First off, the included earbuds are not a great experience. They were constantly being pushed and pulled by the cabling which sometimes causes them to pop out. While demoing the Vive to friends it’s especially awkward to be asked “could you put that back into my ear, I can’t because I’m holding these controllers”. No way, do it yourself! I got rid of them (the earbuds, not the friends) and am using a pair of low latency wireless headphones instead, works nicely. These are what really make the experience something special. The accuracy and tracking are so good you can toss one up in the air and catch it again with only the VR visuals. I’ve noticed no jitter or occlusion issues. Note: When the “lighthouses” are on, they screw with other IR devices you might be using. For example, I can’t control my room lights. Don’t cut corners during the mounting because the moving pieces inside cause these things to slightly vibrate which could cause a shift in position. My “room VR” space is pretty sad. Have I mentioned I live in an apartment in Japan? I now have a garbage can on top of my refrigerator, to give you an idea of the tetris-like compression wonders that had to be achieved to make this possible at all. With the Oculus DK1 and DK2 I was excitedly telling people “we aren’t quite there yet, but this is going to be amazing someday”. Kind of a “Marty, your kids are going to love it” thing. Well, we’re there now, folks. If you can handle the discomfort of wearing what is essentially a tethered scuba mask, it’s now possible to get your mind blown in VR. Vive easily wins the VR wars for now because it can also support room scale. You just don’t get sick when playing “room scale” VR (content designed for you to walk around on a 1 to 1 movement basis). Also, the motion controls being available now would also have put it into the lead, they are a must for VR. We can’t quite knock the CV1 out of the running yet because soon they are going to release Oculus Touch which includes another sensor and motion tracked controls. 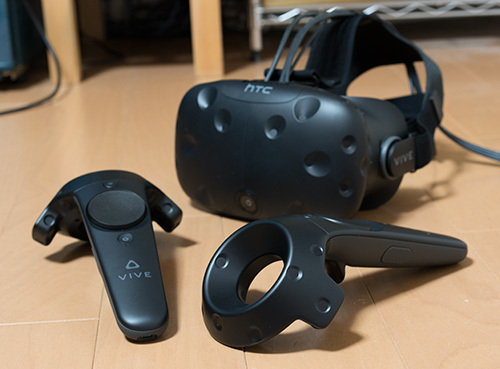 It remains to be seen if it will accurately track at room scale at the quality the Vive does, or even if they suggest trying to set things up that way. I’ve read that games like Job Simulator and Fantastic Contraption are being re-tooled to be “forward facing experiences” for the CV1 and its new controllers, so this points to room VR/360 degree motion control play not being a main focus for the CV1. Unfortunately, even assuming the CV1 will eventually be able to do room scale VR there would be a fragmented market between “People who don’t have the new Touch controls”, “People who do but put both sensors on their desk” and “People who tried to setup the sensors for Room VR”. The Rift store currently has no user rating system so it’s hard to know what the best software is. I had a simple UE4 scene with Vive + Motion controllers being tracked working in 15 minutes using this tutorial. On import, I rotated them by 90 degrees on the Roll and Yaw and they perfectly matched. I unplugged the Vive stuff, plugged in the Rift, checked the “Unknown sources” button in the Oculus settings, restarted UE4 and ran the same test app – it worked first try! I was only 3 inches tall but hey, that could be adjusted. I don’t know anything about distribution builds or how hard it is to get listed in the various stores, but hey, at least it’s easy to play with out of the box. Planning to post some reviews of VR games/apps tomorrow. Do you have any VR stuff? What do you think? 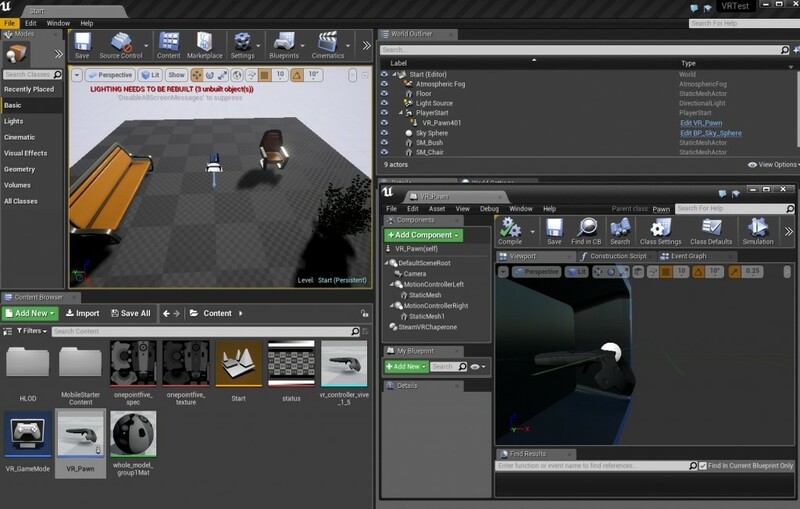 This entry was posted in Development/RTsoft, Reviews, Tech Tips on May 25, 2016 by Seth.